William Humble Eric Ward, 3rd Earl of Dudley, MC TD (30 January 1894 – 26 December 1969), known as Viscount Ednam until 1932, was a British Conservative Party politician. Lord Dudley was the eldest son of William Ward, 2nd Earl of Dudley, and his wife Rachel (née Gurney). 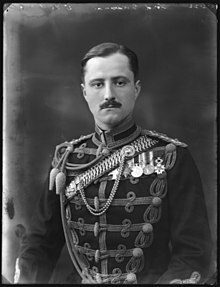 George Ward, 1st Viscount Ward of Witley, was his younger brother. He was educated at Eton. Dudley was commissioned into the Worcestershire Yeomanry in 1912. In 1914 he transferred to the regular 10th Hussars. He was promoted Lieutenant in 1915 and ended the First World War as a Captain, and had been awarded the Military Cross. After the war, he joined the Staffordshire Yeomanry, becoming a Major and receiving the Territorial Decoration. In 1933 he was appointed Honorary Colonel of the 51st (Midland) Medium Brigade, Royal Artillery. Dudley sat as the Member of Parliament (MP) for Hornsey from 1921 to 1924 and for Wednesbury from 1931 to 1932 and served as Parliamentary Private Secretary to the Under-Secretary of State for India, Lord Winterton, between 1922 and 1924. He also held the honorary post of High Sheriff of Worcestershire in 1930. "I cannot stand homosexuals. They are the most disgusting people in the world... Prison is much too good a place for them; in fact, that is a place where many of them like to go—for obvious reasons." Gay rights activist Peter Tatchell said, "The Earl of Dudley's contribution in the Lords sums up the level of the opposition's argument [to the bill]." William Ward inherited a number of industrial concerns in the Black Country region of England, notably the Round Oak Steelworks and Baggeridge Colliery. In 1937, he set up Dudley Zoo within the grounds of Dudley Castle, once the seat of the Barons of Dudley. Dudley married firstly Lady Rosemary Millicent Sutherland-Leveson-Gower (1893–1930), only surviving daughter of Cromartie Sutherland-Leveson-Gower, 4th Duke of Sutherland, on 8 March 1919. She died in a plane crash in 1930, aged 36; she was survived by two of her three sons. He married secondly Viscountess (Frances) Laura Long née Charteris (1915–1990), daughter of the Hon. Guy Lawrence Charteris and former wife of Walter Long, 2nd Viscount Long, on 25 February 1943. The marriage was childless and they were divorced in 1954. Laura went on to marry John Spencer-Churchill, 10th Duke of Marlborough shortly before his death, and died in 1990. Dudley married thirdly Grace Maria Radziwill née Kolin (1923–2016), daughter of Dr Michael Kolin and Anna Tironi and former wife of Prince Stanislaus Radziwill, in 1961. This marriage was also childless. He is said to have fathered a daughter in 1923 with the aristocrat and socialite Venetia Stanley, although the legal father was her husband Edwin Samuel Montagu. This child grew up to befriend Princess Margaret during World War II and marry the American photographer Milton Gendel, with whom she created an artistic salon in Italy. Mandy Rice-Davies claimed that the Earl was one of the customers at Murray's Cabaret Club, where she worked as a showgirl, and that he proposed to her when she was seventeen. "I could have been a dowager duchess by the time I was 22." she said. Dudley died in December 1969, aged 75, and was succeeded by his eldest son William. His second son the Honourable John Jeremy Ward, born on 7 May 1922, died a child on 9 December 1929. His third but younger surviving son the Honourable Peter Alistair Ward (8 February 1926 – 24 March 2008) married firstly on 21 November 1956 and divorced Claire Leonora Baring (born 29 February 1936), paternal granddaughter of Guy Baring. They had several children including the actress and environmentalist Tracy Louise Ward and actress Rachel Ward. ^ "No. 33592". The London Gazette. 28 March 1930. p. 1958. ^ a b Bedell, Geraldine (24 June 2007). "Coming out of the dark ages". the Guardian. Retrieved 27 January 2018. ^ Grey, Antony (2011). Quest for Justice: Towards Homosexual Emancipation. Random House. p. 116. ISBN 9781446434093. Retrieved 27 January 2018. ^ Knight, Charlotte; Wilson, Kath (2016). Lesbian, Gay, Bisexual and Trans People (LGBT) and the Criminal Justice System. Springer. p. 46. ISBN 9781137496980. Retrieved 27 January 2018. ^ "Zoo History". Dudley Zoological Gardens. Retrieved 7 February 2018. ^ "A Six-Decade Roman Holiday". Vanity Fair November 2011. Burke's Peerage, Baronetage and Knightage, 100th Edn, London, 1953. This page was last edited on 21 April 2019, at 22:16 (UTC).